When we first got off the vaporetto with our gigantic suitcases for the summer, we were faced with unnamed winding streets and a myriad of bridges with an ever increasing amount of stairs. Venice seemed more like an obstacle course than the romantic city we thought it was. However, after being treated to a real Italian dinner, which consists of eating a whole 10” pizza individually, professors and students happily chatted, and we knew that this was going to be a promising summer. A regular day for a Pratt in Venice student started with a cup of espresso and perhaps a brioche from the local bar. Then after dodging a few hundred pigeons we would make our way to our class site. 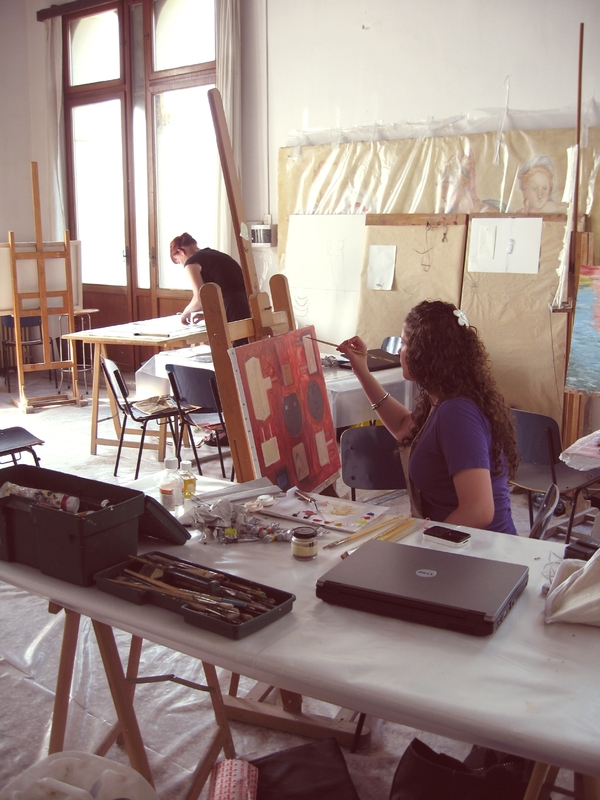 The painting, art history, and Italian classes were held at the UIA on the island of the Guidecca, in a historic building overlooking the sea. Printmaking was held near the Rialto at the Scuola di Grafica in a studio with excellent printmaking equipment. Within the studio classes, the professors were encouraging everyone’s individual goals. Classes were filled with students of various majors, ranging from Commercial Design to Fine Arts to Art History. Our professors were just as excited to learn and take advantage of the Venetian setting. Students were able to make progress in their artwork while still enjoying the environment that had so much to offer. 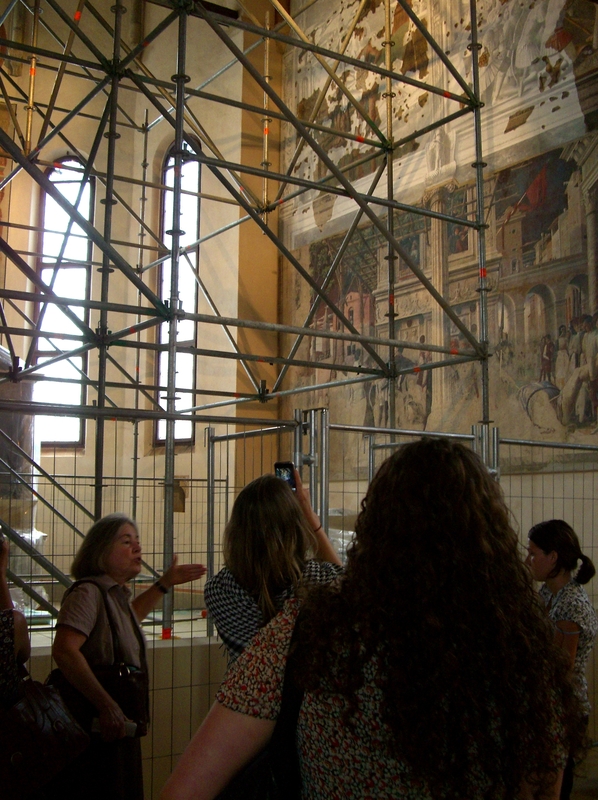 The on-site art history classes held in the Doge’s Palace, various churches, the Scuola San Rocco, and Torcello helped us understand the culture and history of the city that we were living in. The Materials and Techniques class studied the more technical aspects of the art of Venice. Trips included visiting the San Marco mosaic conservation lab, the famous clock tower, the Marciana Library, and the Orsoni mosaic factory. Budgets permitting, our days would end with a gelato. Though there was a gelato stand at every corner, we discovered our favorite near the Rialto bridge. Sometimes on weekends, we would take a boat to the Lido, an island lined with a beach. The weather was nice almost every single day that we were there. One of our favorite excursions in the Veneto was our visit to the Villa Barbaro and the surrounding area. We then proceeded to Bassano where we had an endless and very satisfying traditional Italian meal. The trip then continued with water color painting and sketching of the hills and verdant, rich country side. We ended our six-week stay in Venice with the Feast of the Redeemer, an annual event which celebrates the end of the plague. Venetians build a long bridge across the lagoon before the festival and the Grand Canal fills with hundreds of boats. All of Venice is in celebration. We spent our evening drinking prosecco, eating food, and watching the awesome fireworks show over the water. Venice was an enriching and unforgettable experience for us. Ciao Venezia!